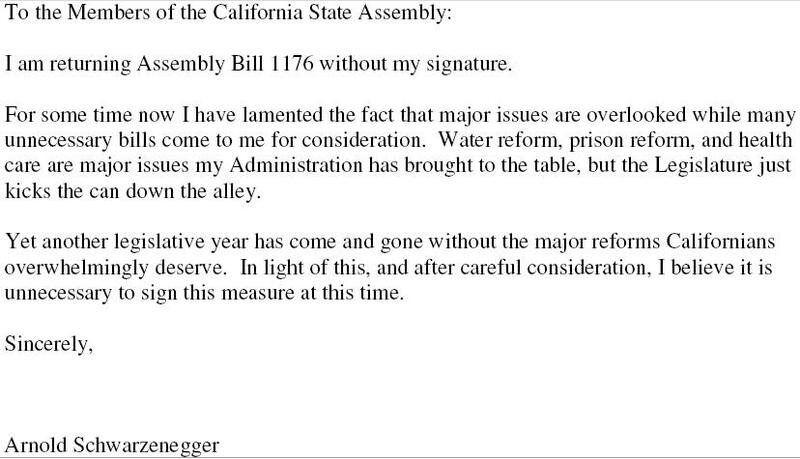 The governor of California recently refused to sign Assembly Bill 1176, sponsored by Rep. Tom Ammiano (D) and dealing with the creation of infrastructure financing districts in San Francisco. Anyone care to guess was the Terminator was really trying to tell Ammiano–with whom the governor who has a well-established hostile relationship–with this? If you need a hint, think format, not content. This entry was posted on October 29, 2009, 4:44 am and is filed under Political Pungency. You can follow any responses to this entry through RSS 2.0. Both comments and pings are currently closed. I’d love to try that in my next work memo. Unfortunately, I can’t control the word breaks in Lotus Notes.